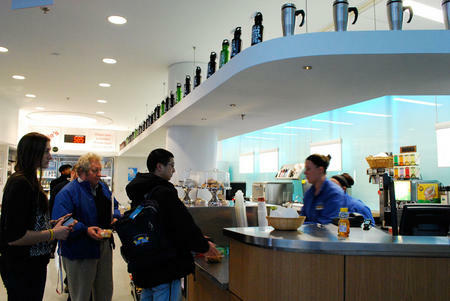 Goldie’s Cafe provides a great new location for faculty, staff and students to get food or beverages in the Physical Sciences Complex. Goldie’s is very popular and can get crowded around the lunch hour. However, now you can order and pay for your favorite menu items right from your computer. Simply go to cornell.webfood.com and click on the Click & Go logo to get started. It’s that easy! Remember, SAVE TIME, DON’T WAIT IN LINE with Cornell Dining’s Click & Go!